WE HELP YOU REMEMBER IT. Meg and Jonny’s small destination wedding in Utah’s Zion National Park. A stunning day with lots of redheads, a beautiful sunset and sweet Regan the dog. Steph and Chris were married at the very industrial North Warehouse in Portland. The day was so fun from start to finish filled with gold accents, bright florals, friends and laughter. Tom and Liane’s intimate wedding held at Portland’s Redwood Deck in the Hoyt Arboretum. It was a small and fast wedding with a stop over at Lauretta Jean’s Pie Shop for a postnuptial treat. Helen and David were married in September in Portland. They held a fun dinner reception at the Elysian Ballroom after we captured portraits in the city. Jeff and Annie. Annie and Jeff. Two of the most fun, free-spirited and all-around awesome people we have had the joy of working with. This was a very fun, vibrant, colorful Portland wedding. Jen and Austin’s backyard wedding just outside of Seattle started with a lot of love and heart and ended with tons of great dancing. Katie and Kent’s Wedding Held in Santa Barbara California. The day started with cliffside views of the Pacific Ocean, a ceremony and dinner under giant Oak trees at Godric Grove in Elings Park, then a dance party under the stars late into the night. We are honored to have been a nominee 4 years in a row (2014 - 2017) and WINNER twice in Oregon Bride Magazine's "Best Independent Photographer" category in their annual "Best Of Bride" awards. This annual awards ceremony recognizes the best wedding vendors in Oregon across all categories. The nominees and winners are determined both by the public and by our peers in the industry. It is a high honor to be in the top three and an even higher honor to have won the entire category in 2014 and 2016. Thank you for your support! Bring us on your adventure! Hi, my name is Maggie. I'm the redhead with the camera in the photos you see here. My wife Lacy is the brunette with the fun brown hair (we call her hair "the schwa"). I’m a photographer, but more importantly, I'm a storyteller. I'm honored to be welcomed into the most exceptional lives and stories, trusted with capturing it all in the most honest and beautiful light. I believe my work is important. 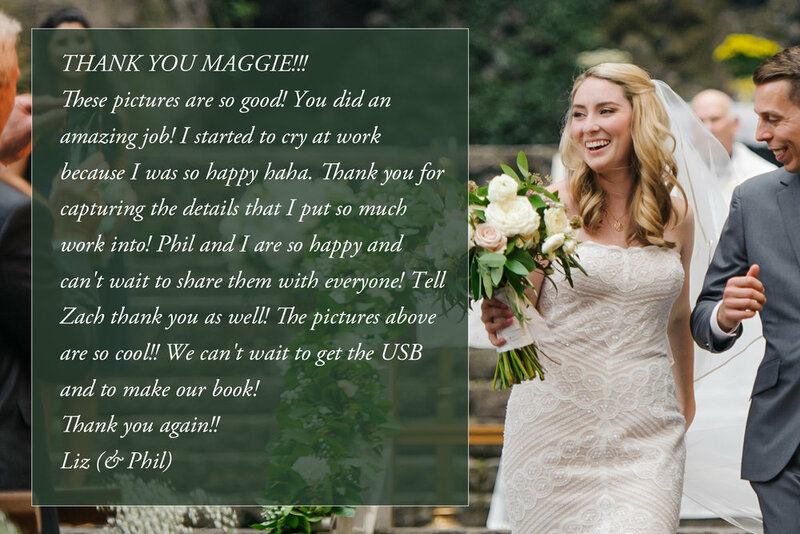 With what I create, my clients are able to revisit their most treasured memories for a lifetime. I'm fortunate to make a living doing what I love. When wedding photography came into my world in 2005, I was totally captivated, and have been ever since that first wedding. I love working with people, problem solving, breaking rules, finding the best stories and exploring new places. Weddings provide an incredible environment that is always teaching me about myself, relationships, love and family. I’m forever grateful for what this career has given back to me and I’m always looking forward to the new opportunities that await me. I've been the primary photographer and the face of my business, Honeysuckle Photography, but have trained and welcomed my wife Lacy into my wedding photography world. She fits right in with her cheerful personality, helpful demeanor and positive attitude. It helps that she loves love and stories as much as I do. She joins me and photographs beside me whenever possible. Much of the work on this site was created with her or by her over the last 4 years. I treat every wedding and every couple as a unique experience from the start. There are no molds or formulas that I will put you in. As your day unfolds, I’m there to document it, not to interfere with it. I want to show your love as it is. If you are silly, I will capture your laughter. If you are emotional, then I will photograph your tears. I work hard to get to know you as a couple so that when you see your photos, they look like you and your day as you lived it. If you like what you are seeing on the site, then it’s time to contact us about your day! I absolutely love to travel and am open to going anywhere to photograph a wedding or any other project. Please don’t hesitate to ask if you have a wedding or special event planned outside of the Pacific Northwest, I would love to hear more about your plans! I PHOTOGRAPH OTHER THINGS, TOO! 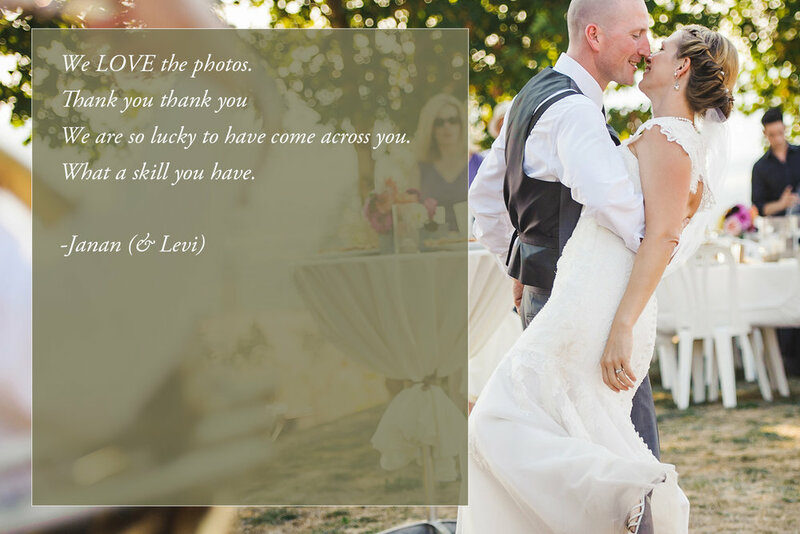 Are you looking for my work that is outside the scope of weddings? I photograph events, people, stories, brands and more! Check out my other portfolio at Maggie365.